Bio-pesticide: Bt (Bacillus thuringiensis) | Infonet Biovision Home. Bacillus thuringiensis (Bt). Bt is a bacterium and is not visible to the naked eye. Bacillus thuringiensis is a naturally occurring soil bacterium that causes disease on insect pests. It is accepted in organic farming and is considered ideal for pest management due to its low cost, ease of application, high virulence and narrow host specificity. Thus, Bacillus thuringiensis is regarded as environmentally friendly with no toxic effects on natural enemies and humans. 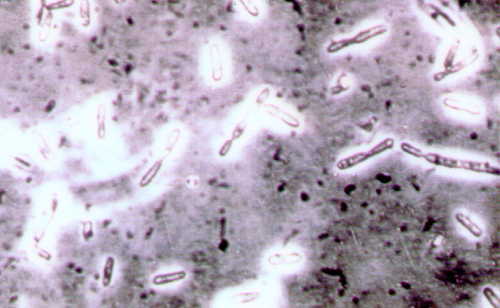 The activity of Bacillus thuringiensis is due to toxins produced by this bacterium. Bacillus thuringiensis is commercially available in most agricultural suppliers. It is sold in various formulations (spray, dust, and granule) and strains (Bt. tenebrionis, Bt. kurstaki, Bt. israelensis, Bt. aizawai, Bt. san diego). Bt. products in Kenya are sold under the following commercial names: Dipell(r), Javelinl(r), Thuricidel(r), and Xentaril(r). Note that not all Bacillus thuringiensis can be used for control of caterpillars. Bt. israelensis is used for control of mosquitoes and Bt. tenebrionis for control of beetles. Bacillus thuringiensis must be ingested by a susceptible host to be effective. When ingested, Bacillus thuringiensis produces proteins that react with the cells of the stomach lining. These (proteins) poison and paralyse the insect's digestive system causing the insect to stop feeding within hours. Bt-infested insects will live for several days but will cause no further damage to the plant. They will die eventually from starvation. 1. Spray thoroughly, covering all the plant surfaces. 2. Apply when larvae are less than 5 mm long or when the eggs begin to hatch. Bt works best on young larvae. 3. In the hot tropics, it is more effective to spray Bt in the late afternoon as there are longer and cooler hours ahead. This enables Bt to remain longer on the leaves' surfaces. Bt survives better in cooler temperature. Whereas, spraying in the morning provides a shorter and hotter environment. 4. Do not mix the Bt concentrate with alkaline water (pH 8 or higher). Alkalinity reduces its effectiveness. To make the water acidic, add a few tablespoons of white vinegar in a gallon of water before adding Bt.